A Bug's Life [is] sure to endure as a superb children's entertainment. 95 min. Buena Vista Pictures Distribution. Directors: John Lasseter, Andrew Stanton. Cast: Kevin Spacey, Andrew Stanton, Julia Louis-Dreyfus, Phyllis Diller, Richard Kind. 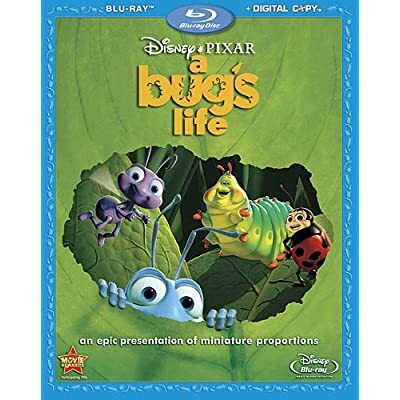 A Bug's Life has a bit of a reputation as the red-headed stepchild in the Pixar catalog, but the film remains, more than a decade later, irresistable to kids and pleasing to adults. The story back in 1998 was how Disney's mortal competitor DreamWorks had produced their own CGI-animated bug picture—Antz—and released it weeks before A Bug's Life in a fit of corporate espionage. While Antz has its own charms, it's A Bug's Life that's sure to endure as a superb children's entertainment. Directed by John Lasseter and Andrew Stanton (who also contributed greatly to its writing), A Bug's Life concerns the denizens of Ant Island, an idyllic community of anthills marred only by seasonal visits from a bullying grasshopper named Hopper (Kevin Spacey). When the well-meaning but klutzy local inventor Flik (Dave Foley) inadvertently loses Ant Island's offering for Hopper, the Queen (Phyllis Diller) and neurotic Princess Atta (Julia Louis-Dreyfus) deal with the crisis by redoubling the ant's hive-mind work ethic and sending Flik on a fool's errand beyond the island in search of help. The highly motivated Flik, of course, takes his job seriously. Encountering P.T. Flea's Circus, he mistakes the performers for a band of warriors and enlists them to return with him to fend off the grasshoppers. It's the Seven Samurai for kids (and a year later, Galaxy Quest would use the same twist of actors mistaken for heroes). The animation is somewhat of a mixed bag, but for the time, it was certainly state of the art. The imagery excels in sunnily recreating vistas and plant life, the character designs—such as those of the circus performers—are mostly top-notch, and the pastel color scheme makes a movie about bugs inviting. The only problem is the plasticine appearance of the ants themselves: it's a given that they had to be cute, but in their limited expression and texture, they're constant reminders of what we're missing from hand-drawn animation. One unassailable element of A Bug's Life is its brilliant voice work, perfect from top to bottom. The supporting cast includes a wee Hayden Panettiere as ant child Dot, David Hyde Pierce as walking stick Slim, Denis Leary as the butch but feminine-looking male ladybug Francis, Brad Garrett as rhino beetle Dim, animator Joe Ranft as German caterpillar Heimlich, Lost in Space's Jonathan Harris as the theatrical praying mantis Manny, Madeline Kahn as Manny's gypsy moth wife Gypsy, Bonnie Hunt as black widow spider Rosie, Michael McShane as twin pill bugs Tuck and Roll, Pixar good-luck-charm John Ratzenberger as P.T. Flea, Richard Kind as Hopper's brother Molt, Edie McClurg as ant Doctor Flora, and Roddy McDowall, in his last role, as ant councilman Mister Soil. Capping it all off are a warm and peppy Oscar-nominated score by Randy Newman (who also contributes the song "The Time of Your Life") and the innovative comic touch of fabricated "outtakes," animated bloopers inserted into the end-credit roll. Buena Vista delivers a definitive special edition for A Bug's Life in its Blu-Ray debut. The A/V quality is stunning, presenting the film in its sharpest clarity to reveal fresh new detail and texture. The color is vibrant, and every Pixar pixel is in its place. Sound comes in a robust DTS-HD Master Audio 5.1 track that simply can't be beat for its separation and subtlety (and power) in conveying the aural nuances and thunderous action of the film. Taken together, the bonus features provide a complete history of the film and an inviting behind-the-scenes sense of the Pixar family at work. First, there's an audio commentary by John Lasseter, Andrew Stanton and Lee Unkrich that offers a great narrative version of the film's creation that specifies production details in a screen-specific manner. The beautiful and funny CGI short "Geri's Game" (4:54, HD) is here in full HD. We also get a fantastic "Filmmakers' Roundtable" (20:58, HD)—with John Lasseter, Andrew Stanton, Darla Anderson and Kevin Reher—that focuses on all of the best anecdotes about the film's production and reception, including taking the film to Camp David to show it to President Clinton. "A Bug's Life: The First Draft" (10:18, HD) comes with an "Introduction by John Lasseter" (:33, HD). Dave Foley narrates pre-production art to show an alternate, discarded version of the story. The classic short that partly inspired A Bug's Life, "A Walt Disney Silly Symphony: 'Grasshopper and the Ants'" (8:27, HD), comes with an "Introduction by John Lasseter and Andrew Stanton" (:35, SD). A Pre-Production section includes the "Fleabie Reel," "Story and Editorial," "Storyboard-to-Film Comparison," "Abandoned Sequences," and "Research Documentary," all with Intros. A Design section presents Galleries of production and concept art, also with an Intro. The Production section includes "Behind the Scenes of A Bug's Life - Production Feature Documentary" (3:30, SD), "Voice Casting," "Early Tests," "Story Reel" (with Intro), "Layout" (with Intro), "Animation" (with Intro), and "Shaders and Lighting" (with Intro). There's also a "Sound Design Featurette" (13:11, HD) and a Release gallery with Posters/Ad Campaigns, two Trailers, and Character Interviews (with Intro). Lastly, both sets of Outtakes (2:28 each, HD) are here, along with "The Story Behind the Outtakes" (3:49, SD), a brief featurette explaining their origin. Self-respecting animation lovers and, I would think, most parents, shouldn't hesitate to add this disc to their collections. All site content © 2000-2019 Peter Canavese. Page generated at 04/17/2019 09:29:43PM.